Home » Vizio TV » Why Vizio Smart TV Won’t Connect to the Internet? Many often complaint about Vizio TV slow Internet connection; or, much worse, the TV is unable to load the media content from built-in apps. How to solve the ‘Vizio Smart TV won’t connect to Internet’ issue? I’ve received a lot of questions about how Netflix cannot be used, how Amazon does not work, or why the “download not available” message keeps displaying. Loss of Internet connection usually happens on any connected device. 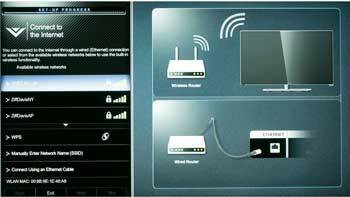 Fortunately, there are still a few ways to help your smart HDTV detect Wifi and access all the apps again. Is it hard to get your TV connected to the internet? Actually the process is simple! For those planning to utilize a hardwired connection, all you have to do is to connect an Ethernet cord of your router to the TV. Well, you already finished! In case you connect your Vizio TV to Wifi, you must do several extra steps but of course it won’t cause you any problem. Remember to type your password if you did set one for your wireless network. That’s it! Sounds easy, right? Once the Wifi password is entered, you will be able to go online with your TV. Now test and see if Netflix, Youtube, Amazon Instant Video, Hulu as well as other built-in apps run smoothly. Learn how to install Kodi on Vizio smart TV now! I get the “My apps are not working” message! In this situation, the reason leading to your apps not working is either the Internet connection problem with your device or issues with apps solely. First and foremost, you have to ensure that whether or not it is the matter with Internet connection. After the onscreen menu pops up, choose Network to open the Internet connection settings. Then go with the Test Connection option helping you test the speed and strength of the Internet connection. You find your Vizio smart TV doesn’t connect to apps after completing the above steps. Maybe the cause lies at the TV or Internet connection. Well, I advise you to get assistance from Vizio customer service. At some points, there are some underlying problems that you need to be serviced instead of handling by yourself. They will try to diagnose the problem as soon as possible. With a friendly US-based representative, you can get a solution quickly to start using the device again. Get the answer for your inquiries by clicking baladnaonline.com!